In the Republic of Ireland there are few matters that are constantly talked about more than the issue of the nation’s public water supply water and the services required for the delivery of water to citizens and businesses. Some politicians are either so tired of the matter or don’t wish to be seen to be on the wrong side of the argument. They are deliberately deaf and blind at times to questions on the subject and when asked by citizens and journalists they just don’t have a clue. They don’t want their lack of education on the matter to be exposed. Either way, they try keep their heads down, duck and dive the issue where possible and most certainly not raise it unless they are sure they are on a winning (vote) side of things! More is said about Irish Water elsewhere in this manuscript. Avoiding repetition, it’s just best to say that many see the antics of those in government as still trying to continue the back-door privatisation agenda of Ireland’s own water services. TV3 broadcaster and journalist Vincent Browne repeatedly confronted ministers on this issue and repeatedly they ducked the matter. They continued to duck truthful accurate answers with instead, long-winded PR statements of distraction, poor denials, empty vague intents and little accountability possibilities. Again, here too, it must be pointed out that Ireland’s water and attached water services should be more guaranteed within the constitution of Ireland – not as some would disaster have, make an actual company state constituted. The latter process would only see that Irish Water would be harder to remove, if for many reasons the public didn’t want it – which many already don’t! Water Privatisation – A Background History. The privatisation of water services in Ireland has been a long time coming in. Beyond the web registering of items like irishwater.ie & related domain names, the history of water privatisation shows just how long certain planners are willing to wait behind their closed doors with their secret meetings and agendas. What follows is a basic history of water service privatisation – but it serves also to show how such things are being done and how long they can be planned! Catalyst: By the 1980’s a majority of the worlds water supply and sanitation services were still technically in public ownership. French private owned companies were at the time part leading the charge into Europe and further, to grab water services for the sake of profit over servicing a public for common good. Their reach extended to include, if they could help it, public construction works, waste management energy and heating services. No other countries had been reached out to more than by the French companies at the time – until the privatisation of water services in England and Wales in 1989. There was a number of important political factors that drove the further privatisation agenda onward. The notion again (via England) that the privatisation of water services could give possible businesses further areas for expansion and potential greater profits spurred on even the likes of the World Bank and others. The World Bank itself PR sold this notion by espousing that such a direction would help to promote water systems in developing countries along with efficiency improvements and better control of operations. At an international conference in year 2000, the World Bank stated that “there is no alternative to privatisation”. From the late 1980’s to 2003, the world share of private water operations grew at an increased pace. French multinationals again having the most luck. In 2002 companies ran into stronger political opposition and with some companies, failure to make good enough economic returns. The main successful French companies were known as Suez (their water division was called Ondeo – originally known as Lyonnaise des Eaux) and Veoila (previous part of Vivendi – originally known as Generale des Eaux). They shared over 60% of 320 million approximate customers now serviced by water privatisation businesses. A third company called SAUR chased the previous two both in Europe and in Africa where it expanded to. English and Welsh companies later attempted to expand internationally. These included Anglician, Hyder, Severt Trent, Thames, United Utilities and Yorkshire. Come 2006 however they have just about reversed their expansion given more difficulties than they had planned for or could resolve. Two energy multinationals also attempted to enter water services privatisation, USA Enron and German Energy group RWE. It was noted at the time that any progress came via making more inroads into further public services rather than private companies actually competing against each other. In order to survive, a number had to combine forces and create joint ventures. Newer private businesses also had to overcome the fact that pre-existing companies already established in water services privatisation, had to their greater benefit, contractual concessions obtained from governments what were 25 to 30 years in length. How could one serious try compete with that? Where there was any growth, it was characterised by close relationships with development banks (including the World Bank and its agenda), politicians and inroads into level of possible political corruption as quiet relationships were facilitated out of each side wishing to gain! Generally, from 2002 onward, many multinationals have run into serious difficulty. They have abandoned many attempts to enter the water services privatisation sector. The trend is apparently worldwide. Even developing countries are witnessing private businesses withdrawals from a market sector they initially thought was workable. From afar it looked a good prospect in many cases – but on the ground and in the area, dealing with many cross-over factors including lack of government stability, bribing greedy and more, reality was more far different in result than what projected spreadsheets could hypothetically predict in success! The level of political and public opposition to water services being privatised had been unexpected in regards how strong and effective that opposition would be and at what speed! Like Ireland, when a great deal of the nation’s people rose over “Irish Water” and a clear state agenda to backdoor see private company’s try money grab for own greater gain, other nations politicians and people, did same. The companies of course expected some opposition – but by and far, they didn’t expect nor plan to cope, with a quantity that did rise up!A natural common reason for the very strong opposition across Europe and further, was the same as many reason Ireland people took to the streets of many a town across the country and to the nation’s capital, Dublin. There was an underlying belief that water supplies and their connected services were an absolute essential national & local service. They should remain in the public domain, under clear state control, not through some (deliberate?) fudged entity, not to be used front-door or backdoor for the gain of private individual or private companies to exploit and personally profit from, at the cost to family, friends and nation! The very notion that companies could monopolise public utilities, incredulously facilitated by political parties who have been known to take questionable money from connected business individuals, didn’t help any degree of hoped success in Ireland alone! The exploitation of such a vital resource was frankly, too much for many a nations people to swallow! Opposition has come from any directions, aimed at multinationals and connected individuals. Consumer groups, elected politicians at local and national level, trade unions, citizen’s groups already in existence or one’s quickly formed, environmentalists and more, have when more focused, been able to defy expectation. They created forces to be reckoned with – much to the shock of those out to endgame, unfair exploit for financial gain, for the elite. Opposition rose up at times not only due to suspected corruption occurring via politicians and officials, being either bullied (through lobby groups or individuals) or they receiving ‘benefits’ immediately (or promised some later when the coast was quieter and clearer to gain), but also that corruption was involved in the obtaining of contracts via inducements, political party donations and more. The state policy making process itself, was thought to have been taken quiet advantage of. Known thought culprits to still escaping arrest. Why? Good question? The two previous reasons were also exacerbated by the third factor that has been partly mentioned. The failure of the private sector to live up to expectations, centred around investments made, acted also as an end-failure catalyst. This too came about due to many reasons. The collapse of national economies, resulted in previous given concessions being then further unsustainable. Companies found it harder to guarantee profits to shareholders. Public sector operations in some cases (as in Atlanta, USA) actually were able to show they would be of greater value over the multinationals, when run right! For one reason or indeed, many, the privatisation of water, its public availability and services utilised to being it that far, has met many a rocky road. A road oft times unexpected. ‘Road blocks’ as such, from financial to public created, have exposed that a privatisation route is not indeed the best result for many. Many nations elected and their very citizens have kopped onto this fact and more so, have shown that they are not going to just lie down and take it! Across the world, a reversal water tide of privatisations has occurred. Public authorities have retaken, re-purchased ownership of related services. Multinationals have much retreated. In some countries workers and unions have a formal ownership stake in the owning of services. Municipally owned operations have more emerged through more public partnerships. The days of being easy able to just jump in, greed-grab a basic vital resource, is much over! If Irish political parties and their too much connected, private business investors, think that after so many years, it would be ok to sly try a takeover of Irelands water and its connected services – a same privatisation stunt on the nation of people that has been tried before elsewhere – they have already found out from 2014 to 2016, such a plan is not now likely to go as they had quietly hoped! A sly process, closed door, tried planed for, against the public? All the more reason for better accountable elected and a better system to quicker to hold the rotten within, to better account? A growing number think so. The better elected have less to fear when they mandate continue to work in the general good of their local and national people. The parties of Fine Gael and Labour have previously massive back-stabbed their own people over this issue but they are not on their own. In double-standards they allowed a ‘free pass’ Ireland had over water charges, to sneakily quietly lapse – and their friendly media buried this lapsing by keeping their print-type presses unused, to highlight its deadline now crossed. Irish Water, the company has been a bloody disaster since it foundation. People that were put in charge of it from the start, had previous expertise of complete huge disasters – ones also that turned out too, mega-expensive besides an operational balls-up! Our elected stupid then for some more crazy reason, put these questionable people in charge of the business. Eventually in time some would jump ship before their term of contract was up, talking with them still, a huge pension and lump of public money in exit payment. Let not forget that it indeed is a business. “Irish Water” whatever else it is – it is registered with the Irish Companies Registration Office (cro.ie) as a registered PRIVATE business. Why repeated asked why this was done, our national elected either repeatedly tried changing the topic or just refused to answer. Hell, even some of the paperwork coming from Irish Water had printed on the very bottom, its footer, that it was a private company. For idiots to turn around then with this fact and more, espousing that Irish Water was not a private company, betrayed another level of stupidity from elected and their again convenient blind, lying supporters. Another (deliberate?) screw-up? Irish Water was not and still being not to date of its existence, answerable to the National Ombudsman. Unlike other state services that operate for the nations people, through the National Ombudsman they could at least try hold such services to question and account. 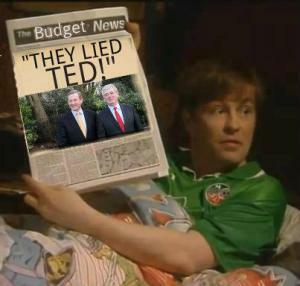 Irish Water? Not so. Why was Irish Water set-up in this way also? Fine Gael and Labour once again are ducking answering that too – as are RTE and other biased media ducking putting that question to them and thus not holding them to account! Why was indeed Irish Water set-up so inherently different form all our other state services that Fine Gael and Labour tried repeatedly to PR shove down throats that “They were all the same”. Cobblers! The simple fact is that Irish Water was and is a complete different entity. The public however in this too, was not supposed to mass kop this also. Biased media here too was saying nothing! So what is the quiet agenda for Irish Water as long as it exists? Officially, the public agenda is to look after our national water and its associated services. Sounds grand in PR don’t it? The public was supposed to remain uninformed about a number of things though? It’s a private company also. Why? Quiet agenda? Non-answerable to the Ombudsman – and elected won’t make it so still. Why the refusal? Quiet agenda? Elected government repeatedly refuse to constitute that it cannot be sold off. Why? Quiet agenda? Elected refuse to state constitution guarantee that our water and its related connected public services, including land and materials, cannot be given away at all for a price or for free in transfer of goods through departments. Why the refusal? Quiet agenda? Elected fail to mention that Irish Water is just part puzzle piece of the TTIP Treaty and its agenda to see that public services are made more open to privatisation and thus private profit gain. Even the TTIP Treaty states it’s an overall aim = agenda! Of course of the honourable and more upfront elected was to do any of the above, the TTIP agenda would be hampered now and further down the road. Why? Only because the public would have to be got back to, for their constitution change permission vote to allow a further privatisation of water public services. If the disreputable refuse to give the public initially what they seek, constitution guarantees, the later problem of trying to gain their permission so more private profiteers can rake in more wealth, could be total avoided. The public is not supposed to mass learn this either though! The biased media here too is saying and exposing nothing. In PR spinning and outright lies, both Irish Water, media and elected have continuously scraped the bottom of their rotten quiet agenda barrel. 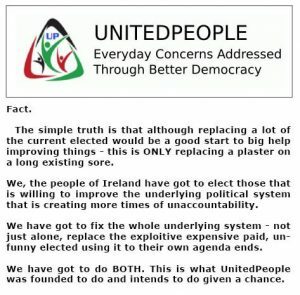 Lies over procedures, lies over numbers, lies over the company itself, lies over protesting numbers, lies over the numbers of non-payers into their press-ganged contracts, lies even of those that were forced to register – but still didn’t pay, lies over its legal formation, lies over people involved surrounding it, lies over their agenda, lies over money, lies over individuals quiet awarded non-tendered (when they should be) contracts …and more! Another example of completely breaking the law of the state by the Fine Gael and Labour Party, was the awarding of the job managing our water and services even before it was a fully legal registered entity. In Irish Law and European law, here alone it is highly questionable as to the legal basis that they were given the role. Even worse, the PRIVATE company was possibly also given people’s personal data before it was also full legal registered. It gets better. The company had possibly not fulfilled all its EU legal insurance requirements before any such info or work, should have been allocated to it. Frankly, the whole company sticks of illegal operations and possible more illegal actions carried out by those aiding or abetting the farce. Will those people be exposed and be held accountable? Not if Fine Gael, Labour and others can help it. You can be sure national media that is more friendly towards them, will continue to say nothing about all this and will go out of its way not to inform the people once again what has gone on in their name and at their very costly expense. Another point – has many noticed that the once “water allocation allowance” that was used in PR terms, to ‘sell’ Irish Water to the public, has in fact now quietly disappeared? Where is all the politicians that sang this once PR pitch? They have all too shut-up about that matter also and have hoped the Irish people have not massed kopped onto that allowance vanish too! CALL FOR THE RIGHT WORDING! To have that, is opening the doors to a disaster. A legal con you are not meant to see coming. If there was a referendum on “Irish Water” on a ballot paper, with enough PR conning or ballot paper boxes going missing etc… “Irish Water”, the company could be enshrined into the constitution. Regarding FG and Labour (some of the Social Democrats – Renua maybe too), this would be a complete disaster. Why? it (a) gives the company massive higher legal recognition – thus ability to re-charge you for ever more and (b) it would be FAR harder for later governments to get rid of it. WE MUST NOT HAVE A REFERENDUM ON “IRISH WATER”, THE COMPANY. What we do need a referendum on the protection of our water and its connected processing services. Its ULTRA-important that people understand the difference. We MUST NOT even chance opening any legal door, to further solidifying “Irish Water”, the company. 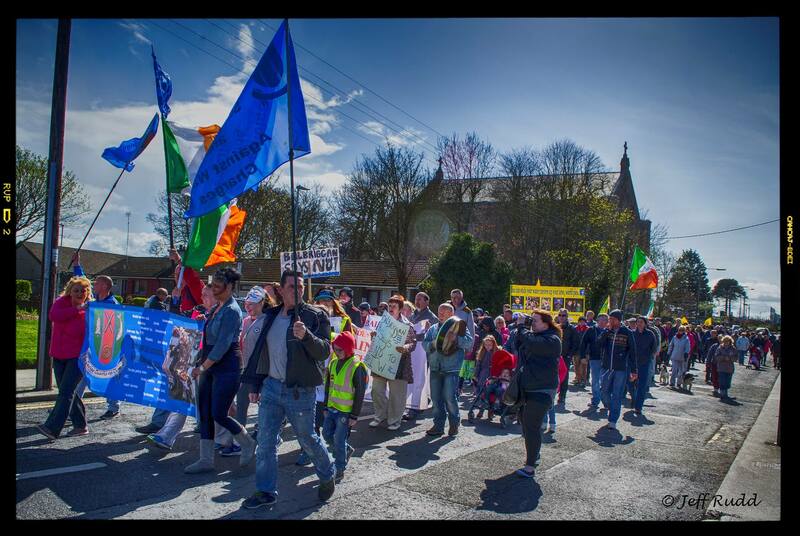 Call for a referendum on a greater “protection of our water and processing services” – NOT IRISH WATER itself! Have “Irish Water” alone enshrined in to the constitution – it also then gives ability to legal block other state bodies that are tried to be set-up, to challenge it (under a different government), remove it or from other better services taking over such water processing functions. Call for the right wording in a referendum, to protect all our natural resources – not any one private company.